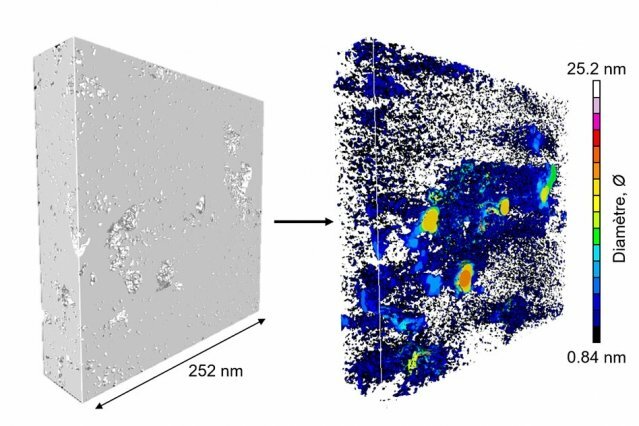 The fossil fuels that provide much of the world’s energy orginate in a type of rock known as kerogen, and the potential for recovering these fuels depends crucially on the size and connectedness of the rocks’ internal pore spaces. To get these detailed images of the structure, the team used electron tomography, in which a small sample of the material is rotated within the microscope as a beam of elecrons probes the structure to provide cross-sections at one angle after another. These are then combined to produce a full 3-D reconstruction of the pore structure. While scientists had been using the technique for a few years, they hadn’t applied it to kerogen structures until now. The imaging was carried out at the CINaM lab of CNRS and AMU, in France (in the group of Daniel Ferry), as part of a long-term collaboration with MultiScale Materials Science for Energy and Environment, the MIT/CNRS/AMU joint lab located at MIT.